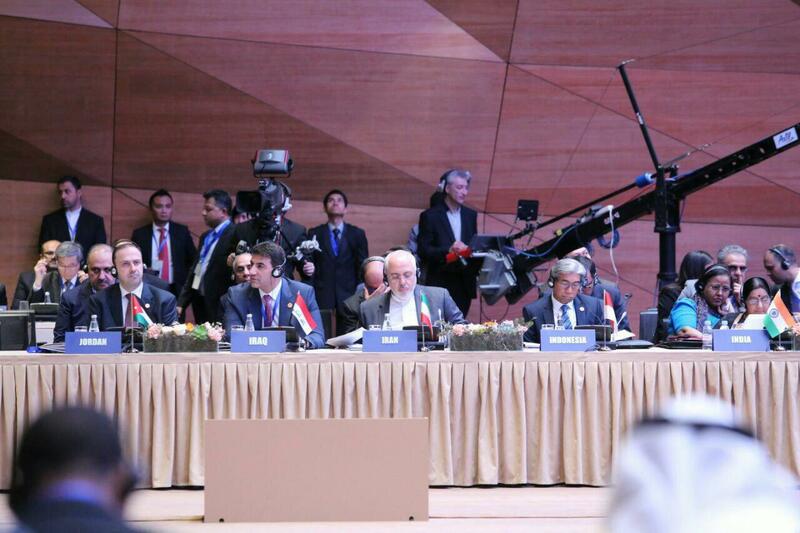 IFP – Iranian Foreign Minister Mohammad Javad Zarif has called on the Non-Aligned Movement (NAM) to pursue the establishment of an international inquiry to bring Israeli criminals to justice in the wake of their recent slaughter of Palestinians. 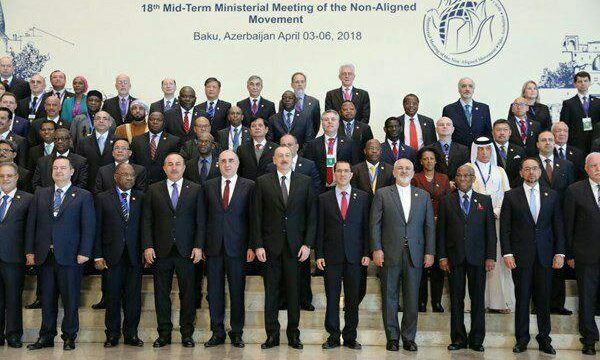 Addressing a mid-term ministerial meeting of the Non-Aligned Movement in the Azeri capital of Baku on Thursday, Zarif said NAM needs to take collective action here and in the UN to condemn Israel’s atrocities in Gaza as well as policies and measures that embolden Zionists. He also urged the Movement to call for the establishment of an international inquiry bringing perpetrators to justice, to demand full restoration of the rights of Palestinians, in particular the establishment of an independent Palestinian state with Jerusalem al-Quds as its capital, and to demand an immediate end to the siege on Gaza. NAM Member States are coming together to forge a collective response to the latest developments that affect our world with a determination to turn the Movement into a more effective vehicle for protecting our nations’ interests. Let me thank the people and government of the Republic of Azerbaijan for the excellent preparations and the warm hospitality. I should also thank the Bolivarian Republic of Venezuela for leading our Movement. We are following with a sense of repugnance the news of the premediated and deliberate massacre of unarmed Palestinian peaceful protesters, including women and children, in Gaza. This is the latest in the long history of Zionist atrocities against Palestinians in the past 70 years, carried out with impunity provided primarily by the US and some its regional and extra-regional allies. Recent US encouragements, especially its unlawful decision on Al-Quds Al-Sharif, have further emboldened this apartheid regime. NAM needs to take collective action here and in the UN to condemn these atrocities as well as policies and measures that embolden Zionists, to call for the establishment of an international inquiry bringing perpetrators to justice, to demand full restoration of the rights of Palestinians, in particular the establishment of an independent Palestinian state with al-Quds al-Sharif as its capital, and to demand an immediate end to the siege on Gaza. The free hand given to Israel is a sign of new rising unilateralism, which is once more becoming the main threat against global security. The previous wave of unilateralism in early 2000s destabilized our region in catastrophic proportions, gave rise to violent extremism and terrorism and exacerbated tensions and crises in West Asia and beyond. Even today and despite the territorial defeat of Daesh by the valiant resistance of the Iraqi and Syrian people, our region is still suffering from the remnants of terrorist groups as well as their suspicious relocations. Unpredictability — due to mutually reinforcing unilateral impulsive measures and continued extremism and terrorism – has exacerbated chronic challenges and uncertainties in West Asia and North Africa. A paradigm shift to regional cooperation and integration is imperative. We need to strengthen our neighborhoods through an inclusive paradigm of respecting the interests of each other and rejecting the outdated paradigm of hegemony and exclusion that only creates tension and leads to destructive arms race. For our immediate neighborhood, we have proposed a regional dialogue forum to redress the dialogue deficit through engagement and confidence-building measures. In the field of disarmament, the growing contempt of the US government for international obligations and its plans to spend $1.2 trillion to modernize and build new nuclear weapons will lead to a new nuclear arms race. Our Movement should resolutely pursue its disarmament priorities through existing mechanisms, including the UN High-Level Conference on Nuclear Disarmament. NAM must continue to be at the forefront of promoting multilateral decision-making, resisting the rising unilateralism. This is of great importance if NAM wishes to pursue its aim of creating a just and equitable world order and global democratic governance.